5 1/8 x 7 3/4"
Frame: 46 3/4 x 29 3/8"
Frame: 25 3/4 x 40"
Frame: 10 3/8 x 9"
Frame: 33 1/4 x 24 1/2"
Frame 37 1/4 x 81"
Frame 31 1/4 x 81"
C.K. Wilde returns to Rosamund Felsen Gallery for his second Los Angeles exhibition since relocating from New York. Wilde's last exhibition at the gallery looked at the narrative power and iconic potential of the horse, a singular object of [American] desire. For this exhibition, titled Sojourn, Wilde continues his practice of intricate collage and appropriation, this time as a reflective exploration of the symbolic and associative powers embedded within a range of materials. Here coins, spices, credit cards, globes, leaves, petals, bumpers and more are carefully re-utilized. We are led to experience these materials simultaneously for their quotidian simplicity as well as the associative power we project upon them. Eventually, the deep iconography and narrative potential we assign to these materials as onlookers/consumers is conjoined with the meaning and signification with which these materials and objects seem to autonomously imbue our world. Books become archaeological digs, 1960's medical diagrams become intimate portraits of the habits of the artist. It is this recursive loop – where we assign meaning to those things that simultaneously assign themselves to us – that appears and reappears in Wilde's work. His collages become agglomerations of materials' embedded meaning as well as documentation of society's excess material. 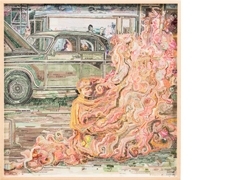 Wilde continues to work through these concerns using a technique of highly meticulous collaging, but has recently expanded his practice to include more overtly three-dimensional works. For the first time, Wilde will be exhibiting some of these pieces in Sojourn. The exhibition will include, along with three sculptures, two editioned books, a series of large-scale collages and a series of smaller collages that have been made from 60's-era medical diagrams. Wilde has formulated a wholly new and creative approach to collage, keeping his work firmly planted in collage's roots as a disruptive medium bent on social scrutiny, while unlocking its superb narrative potential. Please join us in welcoming C.K. Wilde back to the gallery. C.K. Wilde is a co-founder of the non-profit Brooklyn Artists Alliance and has exhibited his work nationally and internationally. His collages and book objects are in numerous private and public collections including the Brooklyn Museum, the Metropolitan Museum of Art, the Museum of Modern Art and the Walker Art Center.